Today there are two main approaches to social inequality in contemporary sociology. One is the neo-Marxist class studies that focus on economic polarization. The other is the neo-Weberian status studies that focus on the concepts of social stratification and mobility. Some neo-Weberian theorists also claimthatstratification is the inequality caused by socio-economic structures. Since Socio-Economic Status (SES) also plays a central role in social stratification and social mobility studies, using SES indexes has recently become common in the social sciences. In Turkey, the lack of such an index became an obstacle to studying Turkish socio-economic status; and that’s why we decided to develop a SES index and conduct a survey with the support of The Scientific and Technological Research Council of Turkey (TUBITAK). The concept of SES is closely related to income differences, educational levels and especially occupational position. A SES Index relies on income, education and occupation variables, yet occupation itself relies on income and education variables. In modern societies, people from any class, group or strata, define themselves in terms of their job. Work life has become more and more important part of actual life since the beginning of the industrialization process. Therefore, to analyze and interpret the post-industrial society, it is essential to take into consideration the occupational structure. Today, occupations have a central importance in contemporary sociology, especially in the studies on stratification and development status scales. Occupational Prestige Indexes represent another methodological approach to clarify occupational structures and work life. In this paper, we aim to present the growing value of occupational life and how it relates to one’s identity, social status and life-style. 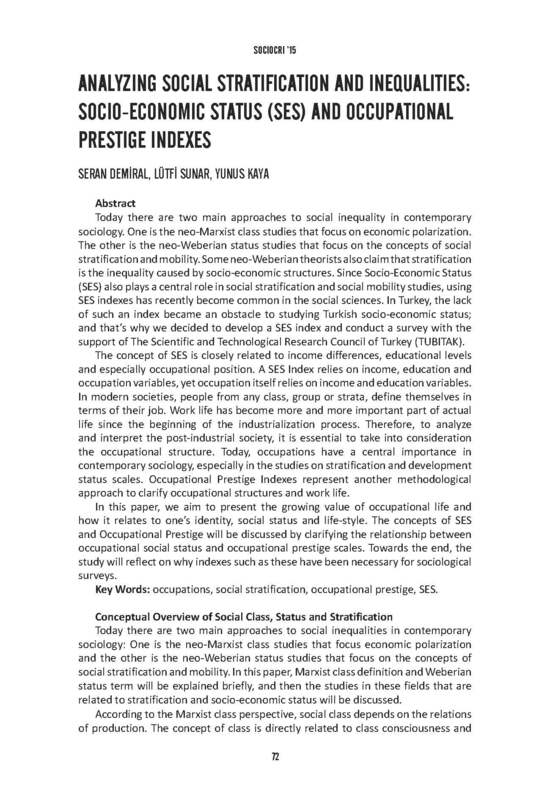 The concepts of SES and Occupational Prestige will be discussed by clarifying the relationship between occupational social status and occupational prestige scales. Towards the end, the study will reflect on why indexes such as these have been necessary for sociological surveys. Key Words: occupations, social stratification, occupational prestige, SES.